Imagine this scenario: you have found a decent apartment and you would move in tomorrow, except for one problem. You can’t take your dog with you. The building complex has dog breed restrictions for apartments that exclude your pet. You must choose between your pet and a roof over your head. For many people, their pets are family and living without them is unimaginable. Yet, that is exactly what they are being forced to contemplate since an increasing number of apartment complexes are implementing dog breed restrictions for apartments. If you have one of the restricted dog breeds, you can have a hard time renting or buying an apartment. What Are Dog Breed Restrictions For Apartments? Is It Fair To Impose Dog Breed Restrictions? Dog breed restrictions for apartments mean that certain dog breeds that are considered rowdy, unmanageable, and dangerous are banned from the building. Residents and prospective residents cannot have these dogs in their apartments. Breed-specific legislation varies from place to place, so it’s important to be up to date on the latest legalities regarding your breed specific law. These restrictions are enforced to protect people from the potential risk of dog attacks and property damage caused by dogs. The resulting legal issues can cost insurance companies a lot of money, and, for this reason, many insurance companies refuse to insure apartment buildings unless dog breed restrictions are in place. Landlords must adhere to the restrictions if they want insurance coverage. Dog breed restrictions differ from place to place. In addition to banning breeds that have been legally deemed dangerous dogs, the landlords may make their own decisions about which type of dogs they will or will not allow on their property. Dog breeds that are allowed in one place may not be allowed in another. In addition to dog breed restrictions, there may be age, size, and weight restrictions. Some places allow only dogs that are over two years old, some places will turn down dogs that weigh more than 25 pounds, and some places will refuse large-sized dogs. Others might ban high energy or noisy breeds. Dogs may also be banned due to space restrictions if the building does not have sufficient area for the dog to exercise in. There can also be restrictions on the number of dogs allowed per apartment. Not more than two, for instance. Check housing websites and make a list of places that welcome pets. See if they have dog breed restrictions and if your pet is on their banned list. Even if their rules and regulations state that they accept all dog breeds, be sure to phone and confirm this. You don’t want to be gobsmacked later. You may be required to pay a pet deposit and a monthly pet rent. Some housing complexes insist on this to cover any property damage the dog might cause. You may have to sign a pet agreement form specifying rules and regulations, like keeping your dog on a leash at all times in public areas, cleaning up any accidents that might occur, not leaving your dog unsupervised for long periods in the apartment, and making sure your dog doesn’t get too noisy. You may be required to get pet insurance that covers dog bites and property damage. It is necessary to consider both sides of this issue. From the point of the landlords, they want to run their rental business without legal hassles and without the social problems created by barking dogs, unleashed dogs, and dog poop deposits. From the point of the other residents, they have the right to live in peace and safety in their apartments, without being bothered or harmed by other people’s dogs. From the dog owners’ perspective, the bias is created by sensational media stories and there has not been sufficient research done to put particular dog breeds beyond the pale. In any case, it is unfair to blame and punish their well-behaved dog for the sins of other dogs of the same breed. It would ideal to handle the matter on an individual basis and check a dog’s history. Only dogs with an established history of aggression ought to be banned. This is countered by the argument that it is more an issue of the capability of certain dogs to inflict more damage than others. A mauling by a chihuahua, for example, is less likely to be fatal than that by a bull mastiff, thus chihuahuas aren’t considered dangerous dogs. Though in many cases, small dogs are capable of lots of damage. All dogs have the capability to bite, and even if the dog has not bitten anyone yet, the possibility that they could in the future can’t be discounted. Is it fair to ask landlords and other residents to bear the risk for a dog you chose to have? Alternatively, your dog might be a gentle giant while someone’s smaller dog might be extremely aggressive. Dog breeds like the Doberman pinschers, Staffordshire bull terrier, Great Danes, German Shepherds, and Pit bull get a worse reputation than other breeds of dogs based on their appearance, size, and loud voice. Owners may find themselves without reasonable accomodation even in pet-friendly apartments because of their breed of dog. The fact of the matter is, this is a very difficult and emotional subject, and there is no right answer. Visit the landlord and see if you can get them to change their mind. Ask them to meet your dog and see for themselves how well-mannered your pet is. Bring along any dog behavioral training certificates your pet has won and, if possible, letters of recommendations from your veterinarian, your previous landlord, and your previous neighbors. Get to know your new neighbors and introduce your pet. They will be less likely to complain about a friendly animal that they know does not cause any disturbances. There are exceptions made for service animals. If you have a disability and require a service dog, you are legally allowed to keep your dog in your apartment, regardless of any dog breed restrictions. Service animals are not to be confused with emotional support animals, though the latter is also able to override many restrictions. Emotional support animals are animals who are prescribed to someone facing mental health issues. They get to override limitations put out by housing providers. Unlike service animals, emotional support animals are not specially trained to be support animals; they are just a companion animal. Emotional support animal rules are not regulated by one governing body, so it is hard to say at this time whether tenants are able to bypass breed bans as they are able to override a pet policy. If you have a support animal that is subject to breed-specific laws, look for fair housing agreements and pet-friendly housing. Most dogs will adapt to living in a small place as long as they get regular and adequate physical exercise and mental stimulation. Without reasonable accommodation though, your frustrated pet could engage in destructive, unwholesome behavior. High energy breeds like border collies are particularly notorious for this. Dog owners who are going to live in an apartment with their dog, you must be prepared to give them sufficient attention. Don’t leave your dog alone and unsupervised for extended periods. If they start barking and howling from loneliness and separation anxiety, your neighbors could take issue. Hire a pet-sitter when you have to be away. Train and socialize your dog extensively, both with people and other animals, so that they are well-behaved both at home and in public. 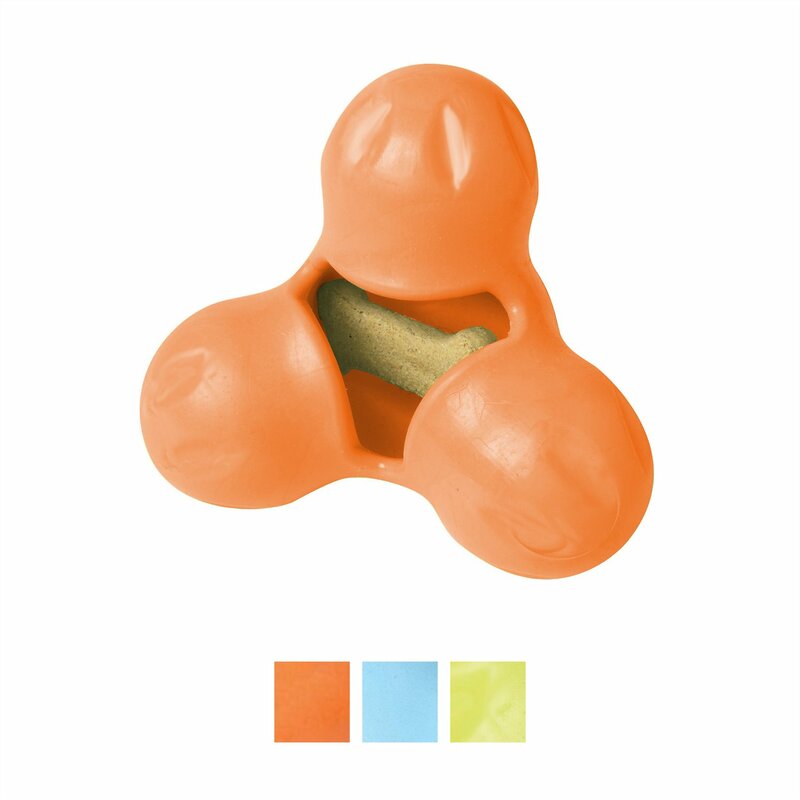 Stuff treats into this toy and let your dog figure out how to extract them. It’s a fun way to keep your pet preoccupied while you are getting your chores done. 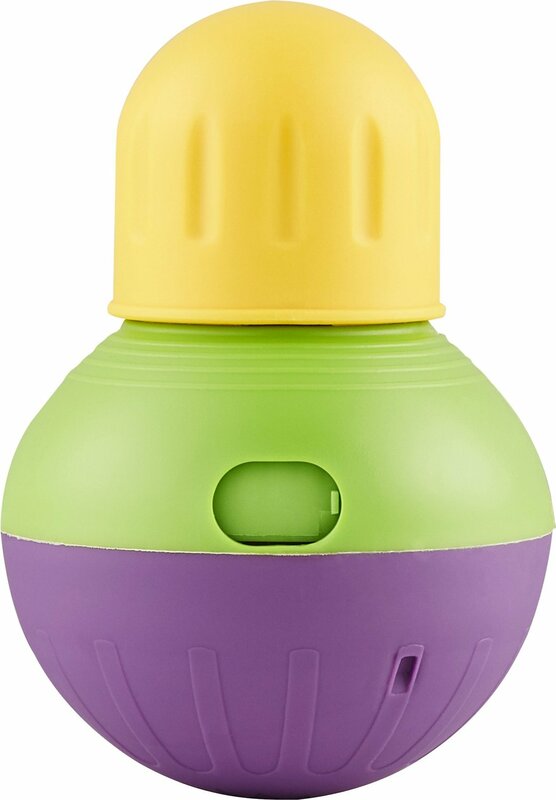 The toy is made of durable and non-toxic plastic. 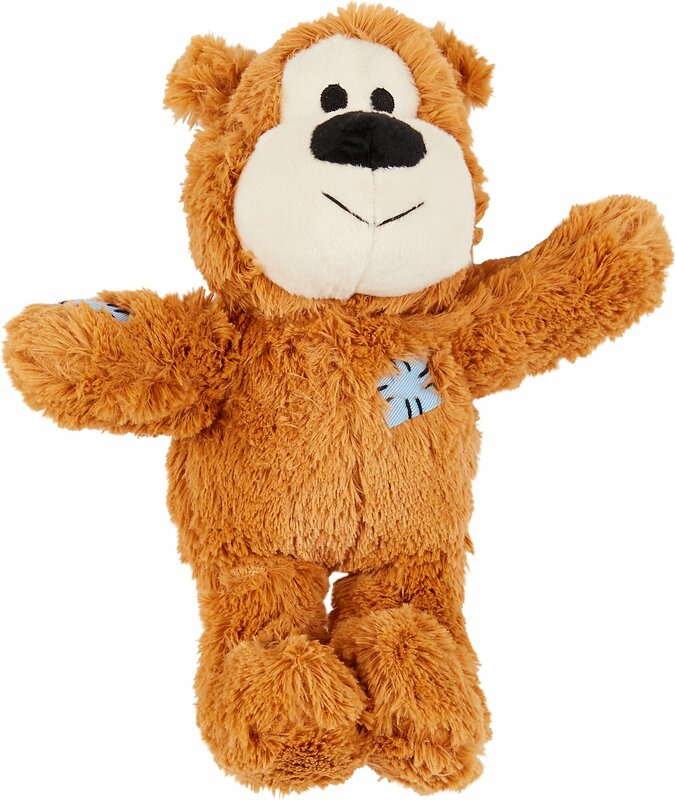 This soft bear toy contains a rope and a squeaker inside, and many pet parents report that their pets love getting the bear to squeak. The toy is durable, but in any prolonged battle with an aggressive chewer, the bear is going to lose, no question. 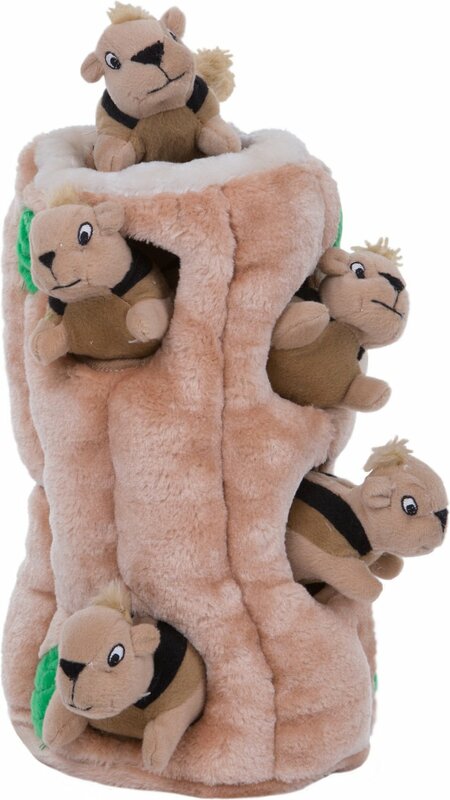 Hide the squeaky animals in the tree trunk for your pet to find, or throw them across the room for your dog to fetch. It should keep both of you entertained, and it is preferrable to terrorizing real squirrels. Fill the toy with treats and watch your pet bat them out. It is a sturdy toy and the weighty bottom keeps it upright. If you have a tiled or wooden floor, be warned that this can be one noisy toy. 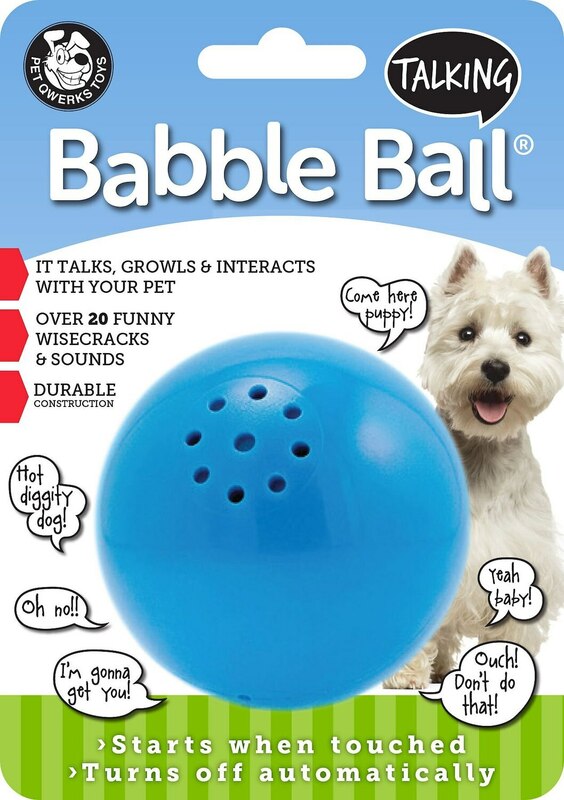 The Babble Ball makes funny sounds and remarks when your pet approaches it and falls silent when your pet moves off. The battery-operated ball is durable and will survive being tossed about. Chewing this cheesesteak flavored Nylabone will divert your pet’s excess energy and prevent destructive behavior. The bone comes in different sizes and can last for a couple of months. Replace it when it gets gnawed to a stub. 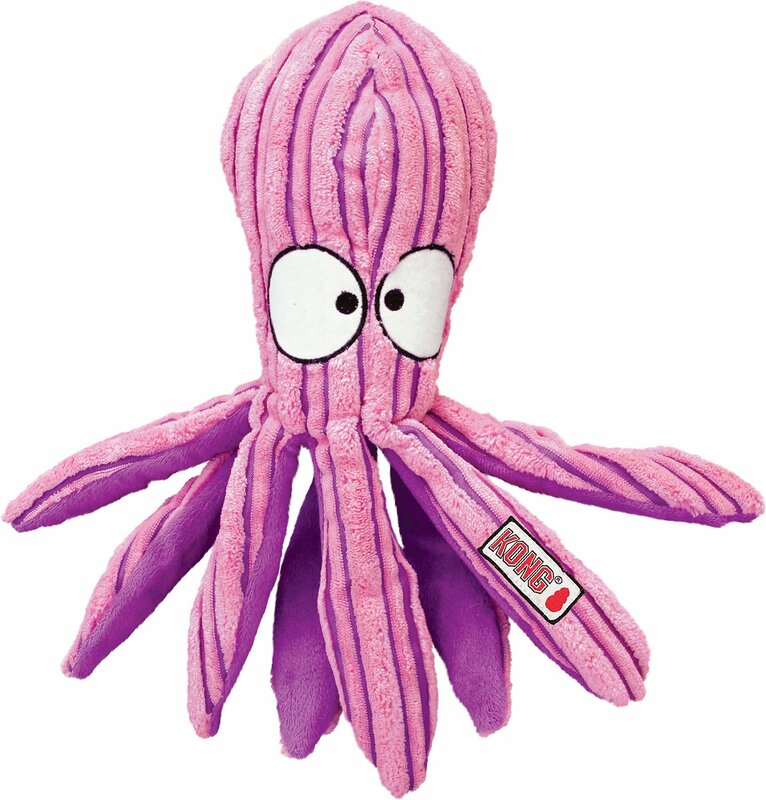 The corduroy Octopus has a squeaker and paper crackle inside that make sounds when your pet chews. This soft toy is ideal for small and medium-sized dogs. 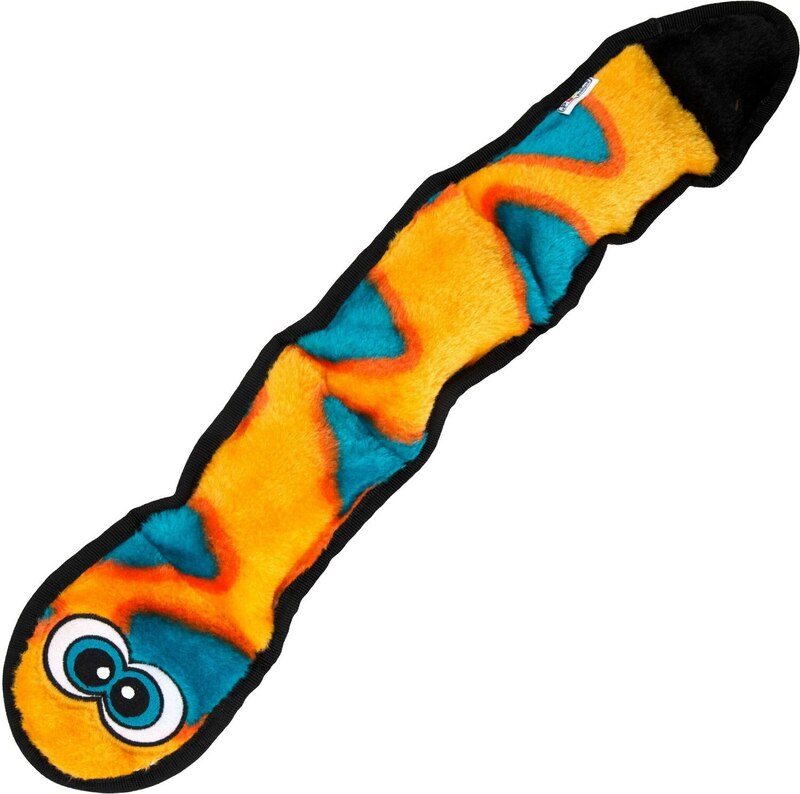 Your pet will love to shake, chew, or cuddle this soft, squeaky snake. You can choose snakes in different sizes and with different numbers of squeakers. The Squeezz toy can withstand a lot of mauling and contains a squeaker inside to keep your pet entertained. It is made of non-toxic plastic. Made from non-toxic plastic, this is great for playing tug and fetch with your pet. It is pretty durable, but if your aggressive chewer takes it apart, remove the toy for their safety. There has been a pushback against dog breed restrictions in several places. In Michigan and Pennsylvania, it is illegal for insurance companies to refuse insurance on dog breed basis. It is possible that the breed-specific legislation may change elsewhere as well in the future. In the meantime, you need to continue to be responsible dog owners, raise a polite and well-adjusted pet, and remain considerate of the people who live in your community. Just because your breed of dogs are listed as dangerous dogs by some, doesn’t devalue the relationship you have with your companion. For more information about laws and breed bans, visit the American Kennel Club.